Wayne County, N.Y. - The annual Wayne County Apple Tour returns for the 20th year this fall. Since 1997, apple lovers throughout western and central New York have explored Wayne County to pick fresh apples, enjoy the fall colors, and enjoy a day of family fun. Wayne County is the largest apple-producing county in New York State. The tour runs throughout the month of October, with a "Tasting Weekend" from October 6-9 (Columbus Day Weekend). Wayne County Tourism partners with 13 local businesses to host the tour, including farms, farm markets, wineries and a distillery. Visitors can download a tour map at www.appletastingtour.com, or pick up a copy at any tour stop. For each stop they visit, they can collect a stamp on the map and at the end of the month, mail it in to be entered to win a gift basket. Before the tour officially begins in October, apple lovers can keep up with tour details and fun apple facts and recipes by liking the Apple Tasting Tour on Facebook. The Facebook Page hosts an online contest every week in September, for the chance to win a $20 gift card to one of the businesses on the Apple Tasting Tour. All 13 stops on the tour offer harvest activities throughout October, and extra-special activities are planned for the Tasting Weekend. Pick your own apples at one of the many farms and apple orchards on the tour. Stop for lunch at the café at Lagoner Farms. Escape the Amazing Maize Maze at Long Acre Farms. Kids can play at many stops on the tour, with hayrides and more. Find your new favorite apple by tasting all the varieties at 10 farm markets. Stock up on fall goodies like fresh pies, apple salsa and homemade preserves. Take home colorful mums and bright orange pumpkins. Enjoy wine tasting at Thorpe Vineyards, Young Sommer Winery and JD Wine Cellars. Try a glass of hard cider at Apple Country Spirits, Embark Craft Ciderworks at Lagoner Farm, or Old Goat Cidery at The Apple Shed. One new stop has been added this year: Wager&apos;s Country Apple in Red Creek. Wager&apos;s Country Apple opened in 1976 and boasts a 100-acre farm full of apples, strawberries, peaches, and sweet cherries. They also have an in-store bakery and barn sale. The Apple Shed also started a new cidey- Old Goat Cider is now part of their Newark shop. Since the Tour&apos;s initiation in 1997, three stops have remained consistent: Burnap&apos;s Farm Market, Long Acre Farms and The Apple Shed. Burnap&apos;s Farm Market is fun for the whole family, with chickens, goats, and a large farm market. Long Acre Farms is known for their Amazing Maize Maze and the Back 40 Adventure, as well as their homemade ice cream and JD Wine Cellars. The Apple Shed has a cider mill making fresh, homemade apple cider, a country café, and a corn slide for kids. 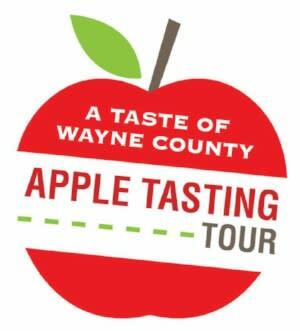 For information and directions to each site, visit www.appletastingtour.com for a mobile locator or call Wayne County Tourism at 800-527-6510. Video available for media: hi def clips of the Tour can be viewed at: https://vimeo.com/30296959 (2011) and https://vimeo.com/77284761 (2013). Please contact Wayne County Tourism or Break the Ice Media at 585-394-0787 regarding usage. New York State has 51,097 acres of apple trees, 20,862 of which are in Wayne County, making it the top apple-producing County in the state. McIntosh is the top production apple in the County. Imported from Ontario, Canada shortly after its discovery in 1811, this apple thrived here because of its hardy constitution and love of cool nights. Other varieties grown in the County include Empire, Red Delicious, Cortland, Rome, Idared and Crispin among other lesser-known types. Apple farming has been a way of life in Wayne County for centuries, and is home to several multi-generational farms. Two recognized Century Farms (100 years) -- Lagoner Farms and Orbaker&apos;s Fruit Farm - are on the Tour and were established in 1909 and 1889, respectively. For more information on Wayne County, the Apple Tasting Tour or the apple industry, contact Wayne County Tourism at 800-527-6510 or visit www.waynecountytourism.com.